Our Westmorland Red Squirrels area is situated in southern Cumbria, taking in a good part of the South Lakeland District and a small part of north Lancashire. It doesn’t cover the whole of the old county of Westmorland. Just within our northerly border are the three valleys of Longsleddale, Kentmere and Troutbeck, then the boundary travels across to Rydal, Loughrigg and on to include Great Langdale. Grasmere has its own red squirrel group – and a thriving population of red squirrels thanks to their unrelenting conservation effort. Our westerly border includes Little Langdale, Coniston and Torver and then follows the shore of Coniston Water into the river Crake and down to where it joins the estuary at Greenodd. The Morecambe Bay coastline forms most of our southerly border, which turns inland near Warton to take in the Arnside and Silverdale peninsula. The eastern border includes Burton-in-Kendal and Holme and then follows the M6 motorway as far north as Junction 37 where it heads off to join our northerly border again at the top of Longsleddale. Although our area boasts some of the most spectacular scenery in the UK, it is far from remote and unpopulated. 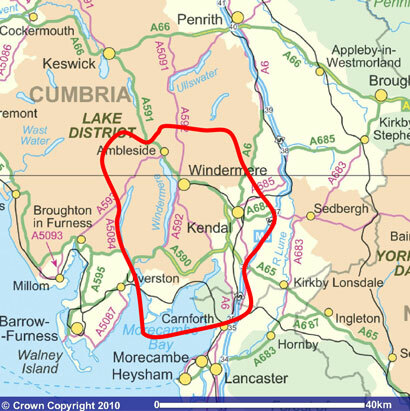 We have several towns and large villages including Kendal, Windermere, Bowness, Ambleside, Coniston, Grange-Over-Sands, Arnside, Cartmel and Hawkshead. Much of our area falls within the Lake District National Park where the attractions of Lake Windermere, Coniston Water, Tarn Hows, Rydal Water and Esthwaite add to the beauty of the Lakeland fells and mountains to make this a very popular holiday destination. Red squirrels have been traditionally associated with this part of the English Lake District, and although Beatrix Potter wrote Squirrel Nutkin when staying on the shores of Derwent Water, we get many visitors to her house at Hill Top in Near Sawrey, including from Japan where her books are very popular. 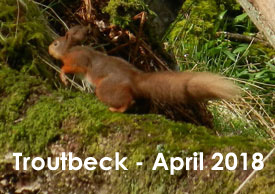 There are still red squirrels at Far Sawrey – the next village along to Hill Top. Silverdale also used to be very famous for its red squirrels and although sightings there are rare at the moment, the red squirrels appear to be hanging on against all odds. 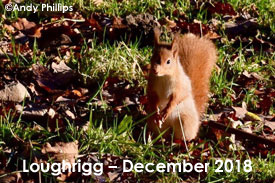 As a group we feel it is very important to conserve our red squirrels where they still exist in South Lakeland, rather than letting them die out through neglect and then having to consider re-introducing them at some later date. This is what has happened to so many of our wildlife species, including red squirrels for large parts of the UK. The extra benefit from making the effort to conserve red squirrels here in South Lakeland is that it will give so many people, tourists included, a chance to see and enjoy these delightful creatures – they won’t be hidden away in a remote and inaccessible forest.